Ohh! so it finally rained. Though its not Monsoon yet but It gave this city, reeling under severe heatwave a much needed respite. No doubt it was a much needed relief from all the sunshine and heat. 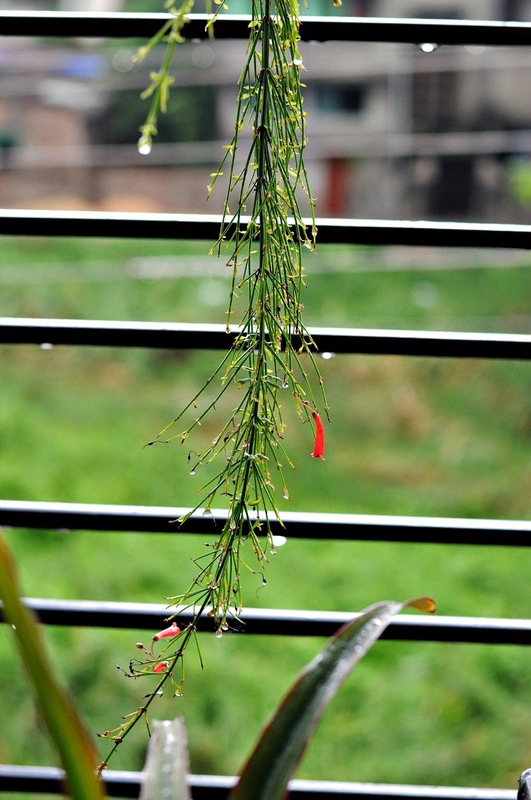 When all of Kolkata came out on the street to drench their body-soul and mind, I on the other hand placed all my balcony plants on the ledge to allow them a good soak. I could almost hear their glee as the raindrops touched their leaves and washed away the summer dirts. We sat there for long, and enjoyed the moments, inhaling the scent of rain soaking on dry earth and the splash of cold air on our face. Little Riti loved the cold weather and as the raindrops sang World's sweetest lullaby she felt asleep...Rain definitely has that power to cool down the Earth, the air and yes all of us. 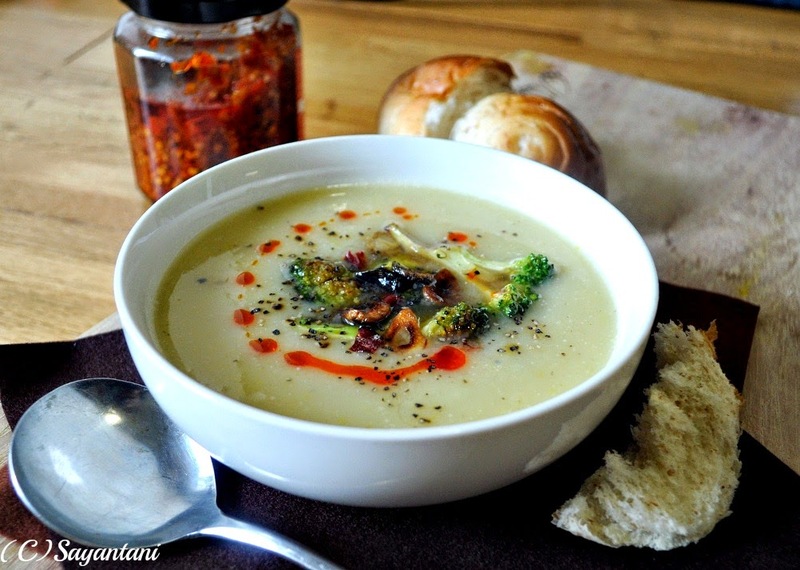 This leek and potato soup followed suite to welcome the cool air and paired perfectly with some homemade atta bread. Leek is a vegetable that belong to onion family and has that distinctive onion smell. The shape is like a spring onion but much bigger than that. Generally the soft white stem part is used in cooking as the green leaves are too chewy and fibrous. but definitely can be used to flavour stock or gravy. Though this is not a common Indian vegetable but these days almost all the super markets are stocking it at a very reasonable price. I first bought it out of curiosity and loved it in soup. 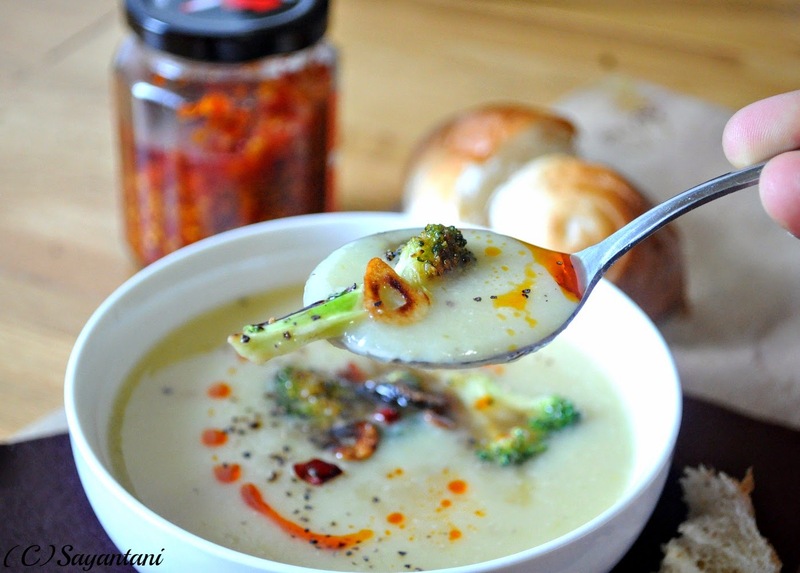 While the onion flavour provides the warmth the potatoes give body to this soup and to provide crunch I sauteed some broccoli and added on top. It's our go to soup recipe for week nights as its the easiest of them all and am yet to meet someone who does not like potatoes. so all in all a winner recipe that pleases everybody and when paired with my favourite chili oil this is the most comforting meal one can have. Cut of the roots from the leeks and also the tough green leaf parts. Wash under running water to wash the dirt on the surface. Use your fingers to rub away the dirts. Cut it length wise and wash again to dislodge any visible impurity. Chop finely and wash for the final time. Drain the water and keep aside. Take a big pan and heat 1 tbsp oil. Add roughly pounded pepper pods. stir and add the leeks and salt. Cook on medium for 4-5 minutes or till they are soft and wilted. Add the potatoes and saute for another 4-5 minutes. Pour in 6 cups of water and the stock cube. Bring it to a rapid boil and then cover and let it simmer for 8-10 minutes or till the potatoes are soft and a fork goes through them easily. Switch off and let it cool a little and then make a puree of it. I use my bigger mixer jar for a few seconds, if you have a hand blender use that. 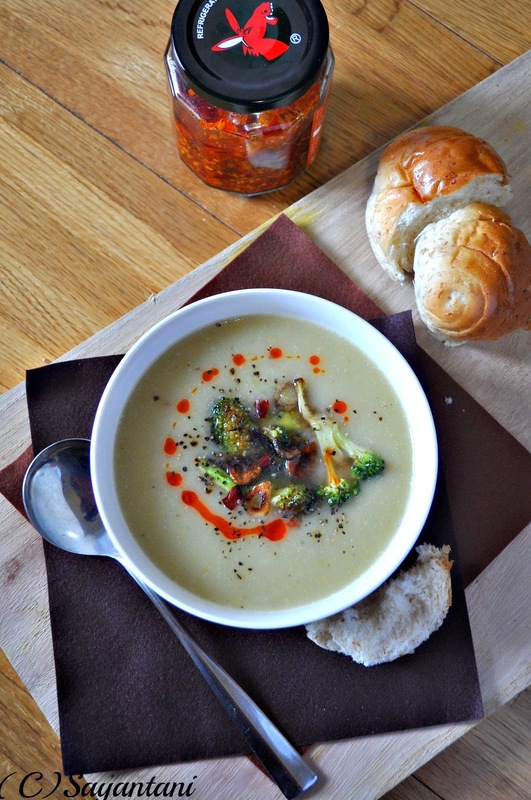 While your soup is simmering and the potatoes are getting done, thinly slice the Broccoli florets. Heat oil in a heavy bottom pan and cook them on medium high with little salt. They should not loose their crunch but should have char marks on them. Take out and keep aside. In the remaining oil fry the chopped garlic till brown. To serve, Ladle out soup on individual bowls. Place a few roasted broccoli and top with a spoonfull of fried garlic. Finally drizzle some chili oil and serve hot with dinner rolls. If you find the blended soup too runny then simmer it for another 3-4 minutes. Contrary is its too thick add little warm water. That soup is so inviting!! Yummy soup, i don't mind to have a cup for my lunch! Thank you for an inspiration! 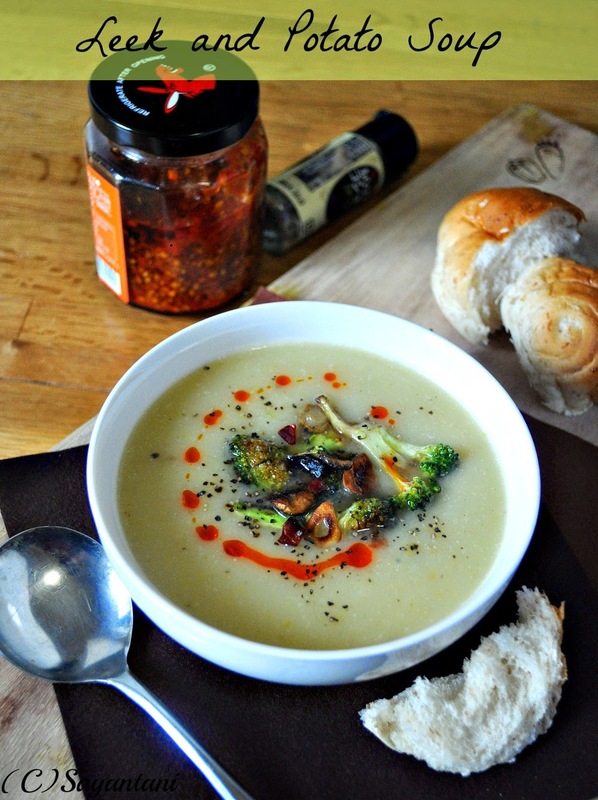 Masterchef strokes - a simple soup glammed up with pan fried broccoli and that oomph from chilli oil! Wow, Wow! Soup looks so good. It is so good.You are tempting me to make it now.